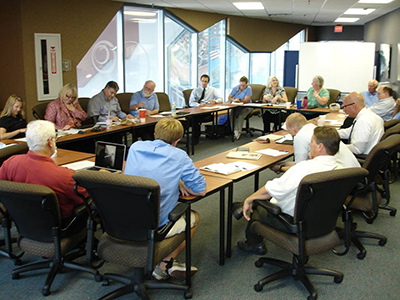 The Monitor National Marine Sanctuary established its Sanctuary Advisory Council (SAC or Council) in the fall of 2005. Since its establishment, the Council has proven to be a key mechanism for identifying and evaluating emergent or critical issues involving sanctuary use and resources. The Council is also vital to having an informed constituency, serving as a liaison between constituents and/or communities and the sanctuary, thereby increasing stewardship of the sanctuary. The SAC's quarterly meetings provide a public forum for consultation and community deliberation on resource management issues affecting our underwater heritage and resources. One of the Council's most important strengths is its diversity of membership. The Sanctuary Advisory Council consists of 21 members: 12 primary voting community members, one non-voting student seat, and eight related governmental voting members. The community seats represent a variety of regional interests and stakeholders, from recreational divers and fishermen to maritime archaeologists and heritage tourism interests, among others. Government seats are related to the sanctuary's mission and include agencies within federal government, departments of the North Carolina and Virginia state governments, and local North Carolina government entities. It is the expertise and experience of these individuals, particularly related to Sanctuary resources and values, which combine to form a highly valuable collective body that is an effective resource for informed and timely sanctuary management. Thank you for your interest in the Monitor Sanctuary Advisory Council. If you have any questions, contact the SAC Coordinator by email or by phone at (757) 591-7329. To keep informed about upcoming public meetings of the Council, or opportunities to apply for Council Membership, sign up to receive notifications. We invite you to check this website for information on upcoming Council meetings and hope that you can join us!